The intent of this publication is to act as a reference guide for individuals charged with the management of environmental risks associated with land and groundwater contamination at filling stations and to direct them to relevant legislation, codes of practice and other publications. hold effective discussions with regulatory authorities on land contamination issues. 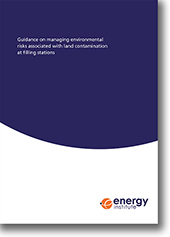 This publication supersedes the former Energy Institute (EI) publication Guidelines for the investigation and remediation of petroleum retail sites, providing updates in the context of the current UK framework concerning contamination of land and groundwater.